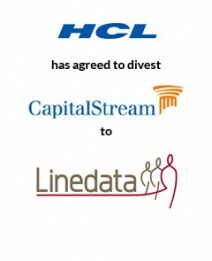 AGC Partners is pleased to announce that its client, HCL Technologies, an Indian publicly traded global IT services company, has agreed to divest its CapitalStream division to Linedata Services, a French publicly traded provider of software solutions and services to investment management and credit industries worldwide. Headquartered in Seattle, CapitalStream is a leading provider of commercial loan origination software and services targeting banks and other financial organizations in the U.S. and Canada. As a part of the transaction, HCL will maintain an on-going outsourcing relationship with Linedata. the transaction is expected to close in the first quarter of 2013. With a team led by Dennis Rourke and Ben Howe, AGC Partners acted as sole financial advisor to HCL.